While the cosmetic and psychological effects of microtia can be considerable, for most parents, the effects of aural atresia may be even more worrisome. Because the inner and middle ear develop at the same time as the outer ear, children born with microtia often have a narrowed or missing ear canal, which significantly diminishes hearing. In conjunction with a highly skilled otologist, Dr. John Reinisch offers a Combined Atresia Medpor (CAM) surgery combining ear reconstruction with atresia repair in a singe surgery . By restoring hearing and creating a new external ear, they can enhance patients’ appearance, self-esteem, and hearing, often in as little as one procedure. To find out if ear drum reconstruction is suitable for your child, contact Dr. Reinisch today. 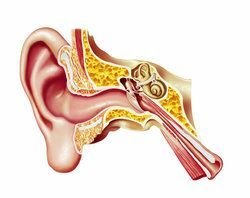 In a normally structured ear, sound waves are able to travel down the ear canal and vibrate the ear drum. When this tissue moves, it vibrates tiny bones, or ossicles, in the middle ear. The ossicles set off another set of vibrations in the fluid-filled middle ear. These vibrations stimulate hairs in the inner ear, sending signals which the brain translates as sounds. However, when the ear canal is narrow or missing, these sounds cannot travel all the way down to the ear drum. Many microtia patients are entirely missing an eardrum. To determine your child’s candidacy for ear drum reconstruction, your otologist will conduct a computed tomography (CT) scan. In addition to examining the condition of the ear canal and ear drum, he will also check to see if the ossicles are fused together. Patients who do not have properly separated ear bones are not good candidates for middle ear reconstruction. Atresia repair is performed under general anesthesia. To protect your child’s health and safety, your otologist works with a pediatric anesthesiologist. When your child is comfortably sedated, the otologist will create a channel running through the temporal bone - the part of the skull located just below the ear. When he gets close to the delicate middle ear, he will use a highly precise surgical laser to evaporate cells and create the last portion of the canal. Next, he will use a skin graft to create a new eardrum. The tissue is typically taken from the scalp, resulting in negligible scarring. When your child’s hearing is compromised, it can affect all areas of life. In particular, children with aural atresia often have difficulty filtering out background noises, which can cause problems in school and noisy social settings. By reconstructing the ear canal and ear drum, Dr. Reinisch and his colleagues can improve your child's speech development and language recognition. With the creation of the MEDPOR® surgical technique, they can now perform microtia surgery and atresia repair when your child is as young as three years old, meaning he or she will have the hearing needed to acquire basic language skills. If your child suffers from microtia and aural atresia, the choice to undergo atresia repair could be one of the most important decisions you make regarding their development. To learn more about this treatment and whether it is right for your child, set up an appointment with Dr. Reinisch today.